If I had to condense what I learned from The Lord of the Rings into one sentence, I would say this: good does not need to destroy evil; good needs only to resist evil, and when it does that, evil destroys itself. Looking at evil, good, and good’s triumph over evil, each in turn, will bear this out. The greatest theme of this book, for me at least, is the seductive, enslaving, oppressive power of evil. I understand fallenness and evil much better from reading this book. Its very telling, for example, that the Ring must be destroyed rather than used (as Boromir thinks it should be) or even hidden (as Denethor thinks it should be). Of all the plots Tolkien could have chosen, he chose this one, where the great goal toward which all the good characters are working is not the conquering of a powerful evil with even greater power, but the destruction of evil by resisting its power. Equally significant is the fact that – at what I think is the most dramatic and most powerful moment in the story’s plot – Frodo cannot destroy the ring. “I have come. But I do not choose now to do what I came to do. I will do this deed. The Ring is mine!” (945). Its interesting that Tolkien in his letters insists that Frodo did not fail – that his captivity to the Ring was inevitable. All of this points to, I think, the seductive nature of evil – its a force that allures us from within as well as attacks us from without, and thus must be resisted as well as opposed. The character Gollum and his moral ambivalence speaks volumes about a realistic view of evil. James Bond movies have a basically two-dimensional view of evil – you have the good guys, and the bad guys, and its all pretty superficial. Much more true to life, and more dramatic in a movie, is a character like Gollum, with his many rises and falls, his two sides, his internal battles – his wretchedness, pitiable state, his final inability to break away from evil. 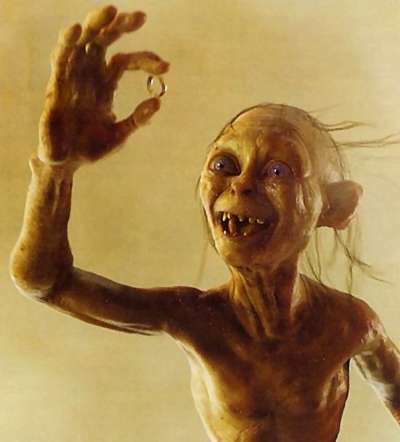 Gollum both loves and hates the Ring – and is consumed by it. Evil is thus portrayed as ensnaring – a force that can capture the will, a power to which one may lose control, a trap from which what half-longs to be released, but half-desires to retain. Just as Grima says of Saruman, “how I hate him! I wish I could leave him!” (983) – but he cannot. You get a sense of how powerful and oppressive Evil is from this story – how seemingly immovable, how unlikely to ever be overthrown. When characters in the book are confronted with evil, its effect on them is terrible. For example, when Merry meets the Witch-King of Angmar in battle on the Pelennor Fields, such a horror comes on him that he is blind and sick, and though he longs to fight, his body lies shaking on the ground. Or when Frodo puts on the Ring, and its alluring power is so strong over him that he loses self-awareness and almost loses self-control: “he heard himself crying out: Never, never! Or was it: Verily I come, I come to you? He could not tell…. The two powers strove in him. For a moment, perfectly balanced between their piercing points, he writhed, tormented. Suddenly he was aware of himself again, Frodo, neither the Voice nor the Eye: free to choose, and with one remaining instant in which to do so. He took the Ring off his finger” (401). What other story gives you such a vivid sense of evil – such a sense of its power, its terror? Or take the threats of the evil characters – the Mouth of Sauron about Frodo: “he shall endure the slow torment of years, as long and slow as our arts in the Great Tower can contrive, and never be released, unless maybe when he is changed and broken, so that he may come to you, and you shall see what you have done” (890). Or the Witch-King of Angmar to Eowyn: “come not between the Nazgul and his prey! Or he will not slay thee in thy turn. He will bear thee away to the houses of lamentation, beyond all darkness, where thy flesh shall be devoured, and thy shrivelled mind be left naked to the Lidless Eye” (841). Its hard to read them without shuddering! The worst character, of course, is Sauron, and the descriptions of him are sickening. But as terrifying as Sauron is, Evil is bigger than Sauron: “Sauron is himself but a servant or emissary” (879). Yet for all its power, Evil is not portrayed in The Lord of the Rings as a static, given reality, eternally opposite of good. As in Augustine, and his friend C.S. Lewis, evil is portrayed as corruption, the corrosive spoiling of good. So when counseling the destruction of the Ring, Elrond reasons, “as long as it is in the world it will be a danger even to the Wise. For nothing is evil in the beginning. Even Sauron was not so” (267). Similarly, when speaking of how the Palantir were originally created for good purposes, Gandalf explains that they became tools of evil when used by those without the art to handle them, and adds, “there is nothing that Sauron cannot turn to evil purposes (597). Also, when Sam and Frodo are discussing how orcs must still eat food, Frodo says, “the Shadow that bred them can only mock, it cannot make; not real new things of its own. I don’t think it gave life to the orcs; it only ruined them and twisted them; and if they are to live at all, they have to live like other living creatures” (914). This is born out through numerous events in the story. So Saruman is killed by Wormtongue, not the Hobbits; Gollum is destroyed by his own greed, not Sam and Frodo; the Ring is destroyed by Gollum, not by the good characters; the Orcs at Cirith Ungol are not slayed by Sam but by each other in their greed for Frodo’s mithril coat; and so forth. As Gandfalf says after a turn of good fortune, “often does hatred hurt itself!” (585); or later in hoping that good would come of Gollum’s treachery, “a traitor may betray himself and do good that he does not intend” (815). When they are able to travel undetected, Eomer observes, “our enemies devices oft serve us in his despite. The accursed darkness itself has been a cloak to us” (834). Or in commenting on how the Dead fought against the armies of Sauron, Aragorn says, “strange and wonderful I thought it that the designs of Mordor should be overthrown by such wraiths of fear and darkness. With its own weapons was it worsted!” (876). In the richness and immensity of the world Tolkien created, one gets a sense of the beauty of good – it emerges as a massive, solid, real entity, perhaps crushing and blinding us, but never boring us. I could see how people could be converted from a nihilist or existentialist worldview to Christianity through the influence of this book. Amidst all the history and change of Middle-earth, good (and evil) are portrayed as pre-dating everything (even the oldest characters), and as unchanging and universally binding. Thus Aragorn says to Eomer, when Eomer questions how one can judge what to do in the strange and changing times: “good and ill have not changed since yesteryear; nor are they one thing among Elves and Dwarves and another among Men” (438). While traveling through Mordor, Sam looks up into the mountains and above them sees a star. Tolkien writes: “the beauty of it smote his heart, as he looked up out of the forsaken land, and hope returned to him. For like a shaft, clear and cold, the thought pierced him that in the end the Shadow was only a small and passing thing: there was light and high beauty for ever beyond its reach” (922). This is something of a foil to point (3) above – as terrible as evil is throughout the story, at certain key points its revealed that, in the end, evil is really nothing. It can do no real damage to good. It has all the apparent power, but none of the real power. Again and again during the story, victory comes only after despair. Frodo and Sam despair a thousand times of ever destroying the Ring before they succeed. The others, even Gandalf, often seem to despair of defeating Mordor in battle before they actually do so. But despair is not the end, but merely a pathway to new strength, new hope. For example, when Sam is in the midst of despairing of reaching Mount Doom, Tolkien writes, “even as hope died in Sam, or seemed to die, it was turned to a new strength” (934). Or as Legolas says during the last debate: “oft hope is born, when all is forlorn” (877). One of my favorite conversations is between Sam and Frodo on pp. 711-712. They are discussing their own adventure in relation to other stories they have heard, and Frodo says to Sam: “that’s the way of a real tale. Take any one that you’re fond of. You may know, or guess, what kind of a tale it is, happy-ending or sad-ending, but the people in it don’t know. And you don’t want them to” (712). I love this. For me it articulates something very profound about life – that a true adventure must, by definition, be unsafe. If it is not risky, it is not really an adventure. For a true adventure, there must be the possibility of despair, of loss, of a sad ending. From outside the story (or from the end) you can look in (or back) and see the certainty of good’s triumph all along. But from within the story, there are moments of true despair before the end – moments where it seems like all is lost. Recognizing this actually gives us hope, I think – for it gives us a reason to never give up, no matter what appearances may be. There is something after despair. The fact that it is Hobbits, and not wizards or elves or kings who bear the Ring into Morder, is very significant. This is what Boromir can never understand, and why he opposes Frodo, claiming that “if any mortals have claim to the Ring, it is the men of Numenor, and not Halflings” (399). Even Gandalf tells Pippin that the hope that Frodo and Sam had of succeeding in their quest is really a “fool’s hope” (815), and that the war they are conducting against Mordor is “without final hope” when it comes to strength of arms (878). The only hope that exists is the fool’s hope – that two Hobbits from the Shire can best Sauron the Great. Its a true David vs. Goliath scenario. In order to achieve victory the good characters must exhibit courage to the point of total self-sacrifice. As Gandalf counsels during the last debate, “we must walk open-eyed into [Sauron’s] trap, with courage, but small hope for ourselves” (880). And so Aragorn responds: “we come now to the very brink, where hope and despair are akin. To waver is to fall” (880). For me one of the best instances of courage in the book is Eowyn’s resistance to the Witch-king of Angmar. After his threat to her (quoted above), she replies: “begone, if you be not deathless! For living or dark undead, I will smite you, if you touch him” (841). “Is everything sad going to come untrue?” (951) ask Sam after the Ring is destroyed. And then: “I feel like spring after winter, and sun on the leaves; and like trumpets and harps and all the songs I have ever heard!” (952). At the end of the everything, after all the smoke has settled, there is joy and redemption, all the greater for the difficulty and anguish that preceded it. The last 80 pages is my favorite part of the book. It makes me long for heaven.